This is the Candidate Rankings page for the general election of the 2012 presidential race. For the Candidate Rankings for the 2012 Republican primary, please see the archive. Each candidate has been ranked according to how likely he is to win the presidency. The odds are based upon how likely his "victory scenario" will occur, and whether the victory scenario is actually a plausible path to victory. The candidates' best strategies are detailed on the Candidate Profiles page. Rankings Last Recalculated: August 20, 2012. Scenario: "Get America Working Again"
Americans cannot be distracted from what concerns them the most: The miserable state of the economy. Liberal economists attempt to make the argument that the economy is improving, but voters are unconvinced. Having failed to fix the economy in his first term, Obama is unable to persuade voters that he will do any better during a second term. Their only hope is to replace Obama with someone who knows how to get the economy working again. Romney steps into the picture, offering a plausible answer for every problem. When Obama attacks Romney, voters are comforted by Romney's intelligent, confident responses. They ultimately view Romney as an acceptable replacement. 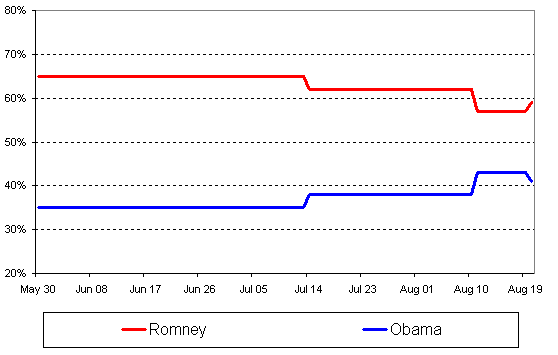 With no hope of better days under an Obama presidency, voters see no alternative but to give Romney a chance. Thus far, reality more closely resembles Romney's winning scenario. Despite the occasional short-term distraction, voters continually rate the economy as their top priority. The state of the economy remains poor, and it is difficult to convince voters that they are experiencing a real recovery. Obama's failure to focus on the economy, and the gridlock in Congress--even when his party held both chambers--make it difficult to sell the idea of a second term with better policies. Romney has presented himself as an able, intelligent politician and businessman. 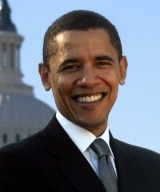 However, he has not yet explained to Americans precisely what he will do to fix the economy. He has taken some heat from attacks, the results of which have been inconclusive. The selection of Paul Ryan as VP will likely bring further attacks. Still, he currently has no difficulty being viewed as a plausible alternative, and Americans are eager for some kind of change. Voters are not optimistic about the extent of the economic recovery. Scenario A remains unlikely, since voters are very much open to a change in direction. Only a significant improvement of the economy would change this. Nor is the stage set for Scenario B. While Romney is given to occasionally indulging in hawkish language, his attention remains fixed on the economy. That could change with news of more nuclear development in Iran, or an attempt by Israel to stop it. Scenario C remains open, but Obama has so far opted for the class warfare route instead. Romney benefits from being superficially different than Bush in many ways: Intelligent, measured, sophisticated, Northeastern, etc. While Romney will be required to explain his economic plans, the differences between the images of Romney and Bush put an extra burden on Obama to show that Romney's economic policies are a redux of Bush's. However, if voters are sufficiently frightened by Romney and Ryan, the status quo will be the "safe" option.